On Sunday, April 22nd we are partnering on a new event for us. 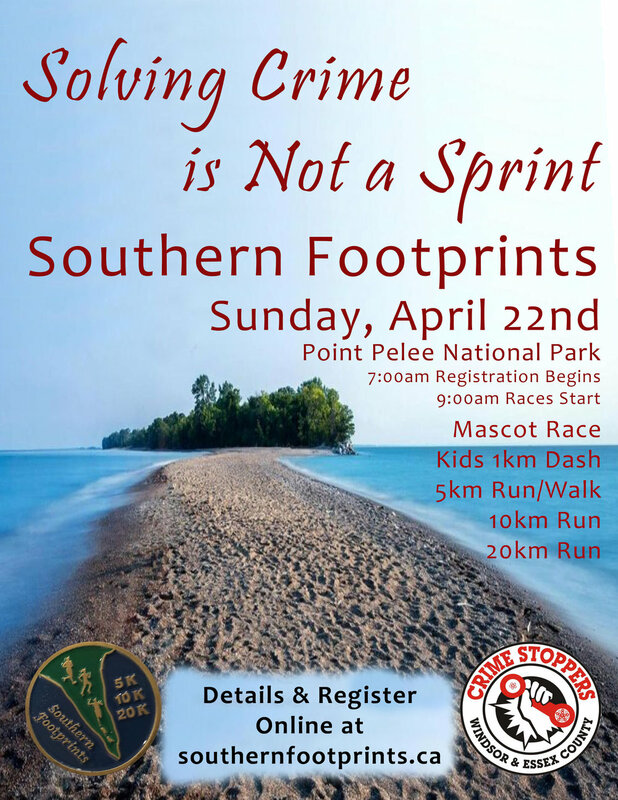 Southern Footprints is a series of races held at Point Pelee National Park. This is the 11thyear for the race, and has quickly grown to become one of the most popular races in the southwest Ontario area. Crime Stoppers is very excited to be involved this year, not only as benefactors, but as supporters as well! We are going to be hosting a booth in the vendor area, running one of the water stations on the course and assisting around the events as needed. You will see red shirts everywhere! Visit www.southernfootprints.ca for all the details and to register. There are going to be four races taking place: 5km walk, 5km run, 10km run and 20km. If you are up for a challenge, I would encourage you to participate! Personally, I will be doing the 20km! Have an amazing day and we hope to see you at the Point! Newer PostHave any Shredding or Expired / Unwanted Medication?